Whether you’re using Ubuntu Linux as a desktop or server, you should be taking advantage of a firewall. Why? Because the firewall is that which can help protect your machine from being hacked. It’s not a 100% solution, but it certainly makes your machine exponentially more secure. However, there are times when that firewall gets in the way. Say, for instance, you’re finding your computer isn’t able to reach the network (or other machines cannot reach you). You’ve restarted your modem and still your computer cannot reach the internet, or be reached via the likes of SSH. What gives? The problem could be the networking subsystem on your computer, or it could be the firewall. Either way, you need to figure out what’s wrong. That’s just one scenario where it comes in handy to be able to disable the firewall on Ubuntu Linux. 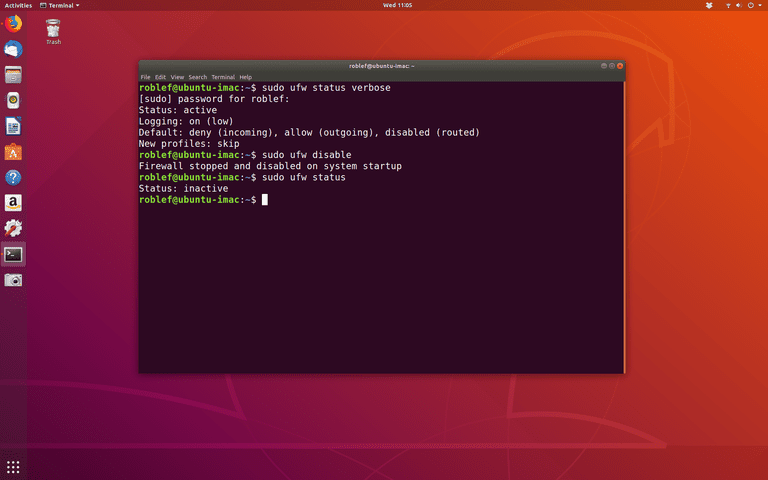 This article will use Ubuntu 18.04 as an example, but the process will be the same on any Ubuntu version that is still under support (so 16.04, 16.10, 18.04, and 18.10), as well as any Ubuntu derivative that uses Uncomplicated Firewall. For all the reasons you might find to disable your firewall, there’s one reason to keep you from doing so, which is the security of your machine. Once your firewall is down, your machine is open to attack. That doesn’t mean the second you drop the firewall you will be hacked. However the likelihood that it can happen increases significantly. To that end, should you find yourself in a situation where you need to disable the firewall on your Ubuntu Linux machine, make sure it is done on a temporary basis only. What does that mean? If you must disable the firewall for a specific reason, make sure to re-enable it once you’ve finished the task at hand. The firewall should be listed as active and will also list out any rules you’ve added. and the firewall will be listed as inactive. Hopefully, that solves your problems. The verbose output will include logging level, default policies, and any rules you’ve added. You will be prompted to okay the operation, before it will go on with the deletion of your rules. This will also have the added effect of disabling UFW. Because of this, you’ll want to re-enable UFW, after running the reset. The end result of the reset is a clean slate with which to start.